BRILEX – GT Explosion Vents are specially designed for relief of gas explosions in the air intake and exhaust of gas engines. By early relief of an incipient explosion, GT Explosion Vents protect the duct, manifold and inline equipment from potentially damaging explosion pressures. Worldwide standards require explosion vents to have a light construction with fast relief dynamics. The resulting venting efficiency at elevated temperatures is documented after dynamically testing each design. Further, GT Explosion Vents are designed for non-fragmentation. GT Explosion Vents have been specially designed for these requirements and dynamically tested by independent institutions. The maximum pressure generated in the vessel during a vented explosion (Pred), will be significantly reduced by the faster opening of the single-section explosion vent. This provides security and reduced costs. Engine installations require an explosion vent that withstands positive pressure cycling at elevated temperatures for elongated periods. Additionally, the explosion pressure generated are very high so the GT vents are strengthened to ensure that the vent does not fragment. Standard GT features are pressure spike control and integrated ceramic gaskets. 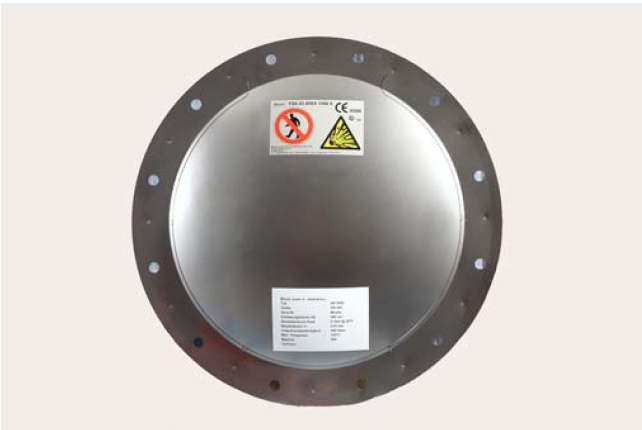 The necessary clamping flange can also be supplied in stainless steel. To monitor an installation, a burst sensor type SE can be installed. The sensor signals the opening of the bursting disc so that the engine can be shut down. SE sensors are installed separately and just above the explosion vent. This enables SE sensors to be easily adapted to existing installations. Each batch of explosion vents is tested in the factory according to CEN TC 305/WG 3/SG 2. Burst tests are witnessed by BRILEX Quality Control (QC) personnel by independently accredited third parties such as TÜV or others, on request. The discs are then tagged by BRILEX QC personnel. Works test certificates (burst test certificates) are provided for all products according to EN10204 3.1 B.